The following documents are available for study and use by communities and businesses adversely impacted by the ongoing nuisance of fraudulent "Going-Out-Of-Business" (GOB) Sales and related scams ("Retirement Sale"; "Lost Our Lease Sale"; "Relocating Sometime In The Future Sale"; etc.). While specifically applicable in the Commonwealth of Pennsylvania, they might have exemplary use in other jurisdictions. Included here are some correspondence by my own company directed to local government which reveals some of the challenges faced in stopping the illegal activities of GOB operators, particularly the necessity for ongoing, determined action to bring about the protections to the consumer, community, and other businesses envisioned in the governing statutes and local ordinances. Pennsylvania Law Governing "Fire Sales"
Quotes From Consumers Regarding GOB "Sales"
Can You Get A Deal At A GOB "Sale" ? The following are long and short versions of the first video in a series of videos by Brandon Oriental Rugs (located in Bucks County Pennsylvania) to help educate rug buyers and rug owners about the different types of handmade area rugs; and their use and care in the home and office. 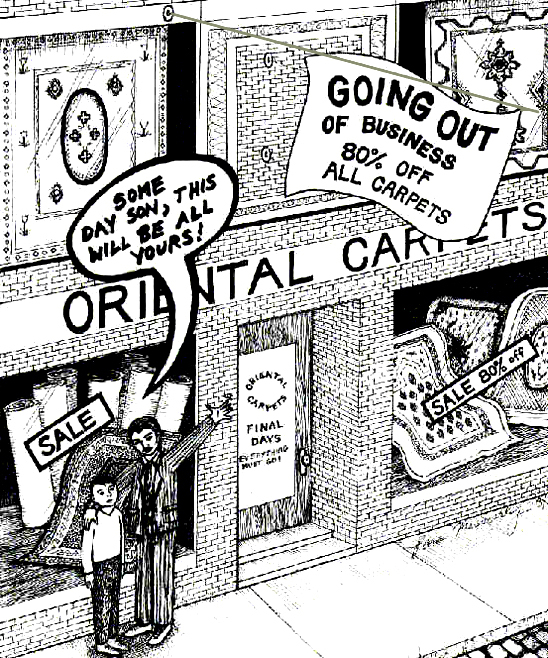 In this first production, "the shocking truth" about tufted rugs is revealed. Serious design flaws in tufted rugs -- sometimes called "handmade rugs" by manufacturers and marketers inclined to stretch the truth -- make them prone to rapid deterioration compared with REAL Handmade rugs. Diagrams, photos, and a live demonstration of a tufted rug being pulled apart are presented to bolster the case that this is a product with problems for the end user and ultimately for the environment (which we all have a stake in protecting.) (Incredibly, the makers of tufted rugs dare to label them "green products" even though they're a garbage disposal problem like that other rubber product: tires.) Well known carpet manufacturers and rug importers like Nourison, Safavieh, Momeini, Couristan, Capel, Shaw, Oriental Weavers (Sphinx), KAS, Kalaty and others produce these rugs in India and China (along with some domestric production in the United States) in tremendous volume. Branded products made by them like Martha Stewart Rugs, Nourison 2000 rugs, Pier One rugs, etc saturate the area rug market, and confuse novice rug buyers with product that looks similar to more costly (and much better made) hand-knotted rugs but provides considerably less long term value than the better rugs they mimic. The REAL benefits of REAL handmade rugs is the background story that is hopefully apparent in this first "Rug Buyers's Guide" video by Brandonrugs.com and will be further revealed in subsequent videos in the series. You're invited to check back often, and visit BrandonRugs.blogspot.com for more frequently updated articles and product information regarding REAL handmade rugs. More material on the problematic tufted rug can be found at Brandon Oriental Rugs website http://www.brandonrugs.com/page21.html . How Is A "SALE" Really Measured ? 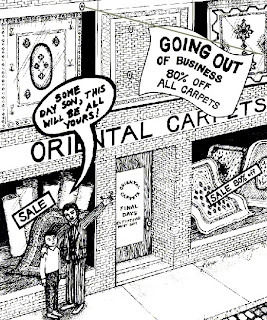 The following ad (one of many in a similar vein by Brandon Oriental Rugs) deals with -- and plays with -- contrasting marketing styles of companies and their choices regarding how they promote themselves. Many companies by their promotions choose to say -- in effect -- "Come see us. We'll give you a BIG discount compared to what we can really, or usually do, charge for what we offer." What they don't say, is that the discount is taken from a number that's usually made-up, manufactured from a formula that allows the discount to be offered. For example: a company wants to sell a product at price= $X, claiming it is 70% OFF the "regular price". But, "regular price" doesn't exist until it's made up from the targeted selling price. So if you want to sell at $300, and want to broadcast that the "SALE" price is 70% OFF of the "regular price", you create the "regular price" by multiplying $300 by 3.33333333 (or so) which equals the awesome, "who could hope to afford it", regular price of $1,000. $300 looks SO good compared to that "regular" $1,000 that folks can't wait to spend $300. It's a conditioned response, and marketers play the market with it constantly. It's important to realize AND remember that the Quality Price Model provides the customer with purchase prices every bit as good as or, usually, better than the Discount Price model. The difference is that it's rational not impulsive; it's providing pricing related to tangible benefits which can be compared, and not arising from some whim of the marketing department trying to manufacture demand by relating unrelated things. Really, what does a day on the calendar have to do with the the underlying reasons for why things cost what they do? Truly, businesses using the Quality Price Model know that President's Day, or Memorial Day, or Mothers Day, or Fathers Day or the Fourth of July or Thanksgiving or Pick-A-Day or the Final Day is coming when the discount stores will be trumpeting incredible percentages off of their so-called regular prices. So the Quality Price Model businesses (and Brandon Oriental Rugs has been one since our founding) make sure that their prices are as good as it gets everyday, all of the time; that way no competitor's manufactured discount event can ever represent a better value to the potential customer. The following article appeared in the Philadelphia Inquirer on Sunday January 16, 2011. It recounts, blow-by-blow, the shenanigans of two erstwhile rug merchants from Philadelphia's Mainline as they go about trying to bury one another while shamelessly ignoring the perceptions of onetime patrons, the statutes of the Commonwealth of Pennsylvania, and the ordinances of Radnor Township. If some TV producers had known about this in advance, it might have been great stuff for a Reality Show. Actually, that might be the only way to make the once lucrative GOB-scam (by which some rug dealers made ample, albeit dishonest, livings in the 1990's) a ubiquitous model again for shameless, irresponsible marketing . Caveat Emptor!